I was born on January 9, 1937, in Bridgeport, Montgomery County, Pennsylvania, approximately four miles from historic Valley Forge Park, and 14 miles from Philadelphia. My parents were divorced prior to my entering first grade, but I still have memories of all the talk about World War II, and recall the rationing, gathering and donating steel to a pile at our school, and even the blackout curtains that had to be pulled when the sirens sounded. I moved with my mother and my younger brother Frank to Berwyn, Chester County, Pennsylvania, at age five and went through all twelve grades in the Berwyn area. When we moved to Berwyn my mother Sarah Gardner McKeon married John Kirk at Ft. McClellan, Alabama, prior to his shipping out for Europe in World War II. My mother was a member of large local family, her grandparents having had sixteen children. She was reared by her grandparents as her mother and father (my grandparents) had died in the flu epidemic in 1918 within several days of each other. I had an older brother Joseph, who died when he was four years old of pneumonia, and have a younger brother Frank, two years younger than myself. He continues to live in Montgomery County, Pennsylvania. My father Joseph D. McKeon lived in Reisterstown, Maryland, and I did not have much contact with him until after graduation from high school. Then it was on a very limited basis, and usually when I made the overtures while stationed at (NSA) Ft. Meade. I received all my elementary, junior and senior high school education in the Tredyffrin-Easttown school district in Berwyn, Pennsylvania, graduating in 1954 from Tredyffrin-Easttown Senior High School. Advanced education beyond that of high school was the army service school at Ft. Gordon, Georgia, in 1955 (The Southeastern Signal School) for cryptography, Pennsylvania State Police Academy after my service with the military, various Pennsylvania Chiefs of Police/FBI schooling for police work, and Howard Community College in Columbia, Maryland, for Information Systems Management. As computer technology became so necessary I took many computer courses throughout the years to keep up with the growing technology. This continuing additional education continues to the present day despite my retirement. I was graduated when I was seventeen years old and my parents would not permit me to join the military. When I signed up for the draft on my eighteenth birthday I drove immediately to the U.S. Army recruitment station in an adjoining town and enlisted the same day. Sixteen days later, on January 25, 1955, I was on the way to basic training at Ft. Jackson, SC. The fact that the enlistment rate was so high, due to everyone wanting to get in under the Korean GI Bill cutoff date, I found my next nine weeks would be in a tent, at the infamous “Tent City” at Ft. Jackson. It was quite an educational period for me, having never been away from home, but I adapted quickly and got through all the fun and games without getting shot at the infiltration course. After a short leave I reported to Ft. Devens, MA, and after only a month there was sent to Ft. Gordon, GA, for schooling at The Southeastern Signal School (TSESS) for cryptography. Actually the military knew what they were doing with me as I was an excellent typist, had a solid background in printing and sailed through the schooling without any difficulty. The school wanted to keep me there as a typing/teletype instructor but ASA had other ideas and I was sent to Frankfurt, Germany. After two months working at the I.G. Farben building, and living at the Gutleut Kaserne, I was sent to my duty station in Berlin (8620 DU). When I got to Berlin I discovered there were only about thirty-eight men in the company, which at that time was under the command of Captain Harry Harrison, and the First Sergeant Jim Stark. I worked at the Military Intelligence Division building in the U.S. Headquarters and U.S. Consulate compound on Clay Allee. It was a fantastic assignment and during a period of four years I spent most of my time at that location, only moving to Tempelhof Airbase for the last three to four months of my European tour. Oh, the many changes that I saw during that period starting with the small Detachment B, 8620 DU, then 260th ASA Detachment, and finally the 280th USASA Detachment. I returned to the U.S. on my last reassignment, to NSA, Ft. Meade, MD, finishing out the remaining five months of my duty. I had been planning to reenlist at that point, but circumstances of married life intervened, and I finished up my military service in January of 1960. I left Ft. Dix Overseas Replacement Company, and flew out of Maguire Air Force base on my first ocean crossing to Frankfurt/Rhine Main, Germany. In no time I was settled in at Gutleut Kaserne, and working my shift at I.G. Farben building communications center. Everything was fantastic when I was in Frankfurt, and for an eighteen-year-old, all the world was in front of me and I looked at Frankfurt as the start of a great adventure. After two months I was informed I would be reporting for duty in Berlin. Everyone had told me it was the best duty in Europe, and I certainly agree with them. While the company was quite small, everyone was very helpful to me in getting me settled, and as the company grew we moved about six months later into a building along side the trolley line outside of Andrews Barracks’ main entrance and behind the U.S. Army chapel. It was an old building that had the center bombed out but we still occupied both sides with the bombed out part in the center closed off. We even had a company tailor named Oscar, who fixed our uniforms, civilian clothes, and put our patches on as necessary. We had a cleaning woman named Gertie, who cleaned our rooms for us. I decided very early on that I was going to like this! Working at the U.S. Headquarters compound was most convenient as Truman Hall was across the street. It housed our big PX and snack bar, as well as the American Express. The Outpost theater was just up the street as well and close by was a great outdoor café at the edge of the Grunewald Forest. Military and civilian bus service provided us all that we needed to get around the city and at all times of night. One of the German linguists I worked with got tickets for Mantovani at the Ice Palace in the spring of 1956. It was a show I will always remember and cherish. We would frequently visit a French restaurant in the northern part of the city on See Strasse, where I had my first taste of escargot. And of course there was so much to see down around the Brandenburg Gate and the Kurfurstendamm. Forty years later when I would revisit, I would be amazed at the transformation of the city and the old German Reichstag, and was so glad I had taken pictures and had memories of many years before for comparison. The Club Resi, Milanos, Golden Horseshoe, Zum Dicken, Wannsee, Havel See, Berlin Am Zoo, Tempelhof, Wiener Stube, Rex Casino, and the Kudam are just a few of those places you will always remember. And that R&R leave we had from Berlin when many of us spent time in Garmisch-Partenkirchen and Berchtesgaden, will always be a highlight. I recall one time in particular when I was on R&R leave, we had to fly out in a C-47 from Tempelhof, as the Russians were once again stopping the trains and harassing the U.S. military. But there were the moments of sadness also. Many of our comrades had short tours, having been drafted, and were only with us for a short time before they returned to the states. It was always a sad time to see them off at the train station as we were all a family, especially in the days when our company strength was less than one hundred. I experienced an unfortunate motorcycle accident when I was riding with a buddy from our company, on September 1, 1956. A German citizen who had been drinking a little too much stepped in front of us at nighttime at a very poorly lit intersection. He died a few days later and my friend, who was driving went through the difficult CID interrogation and investigation. He was later cleared from any wrongdoing, but it was still a most uncomfortable time for us both. Fortunately we both only had minor injuries. That was the end of my cycling days for a while, and my friend sold his cycle when he returned to the states. We had about five BMW motorcycles in the company and it was a favorite pastime, as there were so many places to go in a city as large as Berlin. On one riding occasion, I had bought a guitar along the Kurfurstendamm, and my friend and I came riding back to the company on the cycle carrying this large guitar, and I must admit it was quite a sight. These were those early Elvis days, we all wanted to master the guitar and wiggle our hips a bit. belongings. I rented a small apartment in Zehlendorf in anticipation of my new bride arriving from the states. When she arrived a month later it was a new experience living on the economy, and I enjoyed so much the interaction with the German citizenry. I moved to the government housing area about six months later after being promoted to the rank of Sergeant. The building was next to the Outpost Theater, and was quite convenient to my work and to all the shopping areas near and behind Truman Hall. My favorite outdoor café at the edge of the Grunewald was also next door to the living quarters, and we had the whole Grunewald Forest to walk and explore outside our door. We would bicycle and run with our dog in the woods. Close by were members of my company and we often got together for picnics in the Grunewald or attended various shows. Popular also was the Club 48 (NCO Club) next to the U.S. Berlin Headquarters, and the Enlisted Men’s Club located at Andrews Barracks. 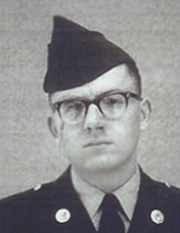 My son, John Jr., was born in July 1958, at the U.S. Army Hospital on Unter Den Eichen. We had identical twin sons, but one child did not survive, and his body was sent back to the states for a family burial. While it was a joyous occasion, it was naturally filled with a little sadness, and I can well remember the compassion and caring that my company comrades and NCOs showed my wife and I during that difficult period. Those men had provided me with all the necessary things you need to purchase when you have a new baby come into the family. I also had many offers of babysitting; some guys I took up on those offers when the wife and I needed to get out for an evening. When my son was born I had also bought a boxer from someone selling the puppies in front of Truman Hall. The dog became quite an important part of our small family, also rotating back to the U.S. with us when we had to go home. I had purchased a 1948 Oldsmobile convertible for a little luxury while in Berlin, and that car certainly did provide that. I only paid $200.00 for the vehicle, and when I was nearing my time to leave Berlin I sold it for $200.00 to another member of our company. While it seemed like a tank, gas was cheap for the military personnel, and the car ran quite well. I always felt a sense of pride with the work we did in Berlin, and never, to my knowledge, did we ever have any security breaches or compromises in our communications/crypto center. We had a great crew that was all very security conscious and efficient. needed a quick repair, but that didn’t happen very often. We had the best equipment available at the time, making our job that much easier. While I served in Berlin we had many crises, such as when the Russians were harassing everyone when they could, the original Lebanon crisis, Hungarian crisis, Polish crisis, and above all, we had the whole cold war problem constantly plaguing us, and we could even say the Sputnik crisis, as it sure created a rumble. Good communications were very important and we all took our jobs very seriously. I was fortunate to have had good officers and noncoms guiding me along the way that did help make working enjoyable for that period of time we were in the military. Time had run out for me in Berlin, and while I would have willingly served more time in the Berlin Theater, I had to rotate. Due to the fact my wife was past six months pregnant we had to return to the states by the good old MSTS (Military Sea Transport Service) General Buckner. Any who have had that experience will agree it made us realize why we were in the Army and not the Navy. We had a terrible crossing, three days of which were going around in a small triangle, not really going anywhere. We couldn’t do too much to entertain ourselves as the pitching and heaving of the ship did not permit you to even play cards comfortably. I had a pregnant wife, a one and a half year old baby, both of whom I had to tie in their bunks at night, otherwise they would have been tossed out, and a dog in a kennel on the fantail of the ship housing our dog. The fantail was off limits for four days and that 85-pound boxer lost quite a few pounds. We did arrive in New York eventually, a little pale, weak, underweight, and mighty glad to be off the water. The only nice part was that as a NCO I did have a compartment with my wife and son. I can very well remember three years before when I had the opportunity to enjoy all the comforts of communal living on another MSTS ship returning on reenlistment leave. After a short leave I reported to NSA, Ft. George G. Meade, Maryland. At the time I didn’t realize it would be the end of my career in the military but it was to be just that. I had new government housing within walking distance to my work, and had many friends living in the area that I had served with in Berlin, making my last tour, most enjoyable. I had left my wife at home in Pennsylvania to be near the Valley Forge Army Hospital when she was due to deliver. However, tragedy once again struck, and we had a daughter who lived only a very short while. I want to say we both got past this tragedy, but it would cause many marital problems down the road, and in the end, I do not believe my former wife ever got past it. I made a decision when I left the military to apply for an opening on the local police department. Like most police departments, there were many trying for the one open position, but several things appeared to be in my favor. I knew some of the supervisors of the township; was good friends with a number of the police officers having grown up with them and who were already on the department; had a good military record, and was a local guy who had been quite active in a number of activities in the community prior to entering military service. I got the job and when the opportunity to attend the Pennsylvania Police Academy in Hershey, PA, was offered, I applied for the school. I found myself being promoted to Sergeant shortly after I completed and graduated from the training. I thought I was on the fast track in my field, but found that I was rather naïve when it came to the politics of police work. I became embroiled in a police controversy and lawsuit involving the Superintendent of Police. I was the arresting officer thus making me the object of scorn of many police officers, and political figures. In other words “Don’t fight city hall”. Approximately five years later the superintendent was found guilty of the seven charges brought against him by me, but my days in police work were over. The principles I had tried to bring out about being an honest officer had cost me my job, several lucrative job offers, and my marriage. Another opportunity to work for a rather large city police department doing some under- cover drug informant type work kept me in the law enforcement field for a short time. Being rather young looking at the time I accepted and worked with the unit for approximately five years, until several very young children died in my arms as a result of drug use. I left that type of work, believing I had paid my dues and no longer felt I could perform the job properly and needed to detach myself from that type of work. It was an eye opening experience, which I feel helped me to further understand drug use and its horrendous consequences. Being an excellent typist through the years and involved in printing since school I began working in the field of computer typesetting and book publishing. It was a very lucrative field when I first went into that type of work, and I worked for several large type houses, and several newspapers in Pennsylvania. With the advent of computers the publishing business had changed considerably, and you were not able to command nearly the salary it was years ago. I had my days and was able to get my children through school, and enjoyed working in the field for many years. I had my own business for a short while in the early 80s, but with the recession, went back to working in industry rather than continuing on my own. I still do much work in that field, and occasionally do a few newsletters for some organizations in the Florida area, even though I am retired. And while home computers may have taken away a lot of the work I had previously done, I am glad that I am able to communicate online through the computer, and also keep up with the myriad of changes happening daily in computerland. It is most enjoyable to talk to that army buddy via computer in California, as well as those others that I had served with in the military. It was during my work at a local newspaper that I was introduced to my present wife, Sondra, in 1973. A co-worker celebrating his birthday, which fell on Christmas, wanted me to meet a classmate of his wife. Six months later in June 1974 we were married. At that time I gained a wife, two teenage daughters, two cats, and a dog. After eleven years of being single, it was quite an adjustment, but one that I knew I was ready for. I had three living sons from my previous marriage and here I was with two new daughters, who were very young, and I was starting with a new family. Many times Sondra has told me that she wished she had known me when I was in the military. It is amazing how fate somehow changes the course of our lives. At this point I cannot really complain as it has been twenty-nine years of a wonderful marriage and we still enjoy and love each other, and do things together. At last count we have 13 grandchildren and one great grandchild so you can see we are not at a loss for excitement. The girls live close by in Jacksonville, FL, and the boys continue to live in Maryland and Pennsylvania. I am a person who has always done things for everyone else, and I believed the time had come for me to do something for myself. The trip back to Berlin and Germany in 1999, while it was a trip for me, my wife, Sondra, enjoyed it very much also. Her ancestors had come to the United States in the 1700s from Germany and settled around Bloomsburg, Pennsylvania. Through her ancestor, who served in General Washington’s Continental Army, she has become an active member of the Daughters of The American Revolution, and Vice Regent of her chapter here in Florida. Tracing her family back to Germany and their arrival in the United States was a labor of love, accomplishment, and joy to me as well. Many of the records and deeds were in German and I was so glad I still had some knowledge of the language left in me. We returned to Germany for the 1999-2000 celebrations, and were not disappointed. Through a relative we were in contact with a husband, who was German, and his wife, who was Dutch, who lived in Hubingen, Germany, northwest of Frankfurt/am Main, near Koblenz. It was to be our home base during our three weeks in Germany, except when we were traveling throughout Germany in our rented Volkswagen Golf. It snowed almost daily during that December and January, and while it was beautiful, it did cause me to change some of my plans due to rough road conditions. That of course will require a return visit. When we arrived at Frankfurt International Airport we had this unknown person holding up a sign “McKeon family? ?” as we had not met our host, and after we met we felt like we had known each other for years. I was absolutely surprised at myself and how my German had stayed with me all through the years, and was able to converse so well with our host. He did not speak English although his wife did. I have to add that my wife was very impressed at my linguistic talents, since she didn’t know any German at all. She hit it off very well with our host’s wife, who did speak some limited English, and it helped make our trip so pleasant. I was surprised at the reluctance to speak English by many persons on this trip. It seemed to me it was only the youngest of persons that would speak English and it gave me the impression they wanted to try out their English abilities on someone. A waiter in Spandau waited until I was finished ordering, eating, and having dessert before he spoke perfect English to us. I just assumed no one spoke English and went ahead and ordered my meal. It was a special treat to be in Spandau as none of us were permitted to visit that part of Berlin when I was there. The Outpost Theater is now a museum, and next door was my former government housing building and is very close to how I left it. My favorite outdoor café at the edge of the Grunewald is now a McDonalds. Truman Hall is no more as well as the commissary and many buildings behind Truman Hall. The U.S. school is closed and a lot of the housing is being ripped down and replaced. The Army Chapel is there near the gymnasium at Truman Hall but a chapel for English speaking Catholics. And especially sad for me is to see the U.S. Headquarters compound where I worked so many years, closed up and in some areas boarded up. The Club 48 (NCO Club) was now what appears to be a daycare or nursery school. Many Saturdays were spent there sipping up that good German brew, and eating those fine meals. I visited the house where I had rented an apartment in Zehlendorf when I was on the German economy, and it was like I left yesterday and came back today. My only problem finding it was that many of the lots that were vacant then, now had buildings on them making the Zehlendorf area so grown up compared to when I was there. The U.S. Army Hospital, where John Jr. was born, is now a chemical manufacturing company. I went to see Olympic Stadium and it is very similar to when I had last visited years before. My wife and I circled the interior of the stadium and read the plaques on the end mentioning those Americans who did so well in the 1936 Olympics. We visited the Soviet War memorial and found it so different as there are no longer any guards. The German Reichstag was in ruins when I was last there and is now quite a beautiful and impressive building, being restored to its early beauty before its burning before the war. The Brandenburg Gate/Tiergarten area is greatly improved. It was so different for me to be able to be walking on both sides of the gate. While I was there before the wall went up, naturally we were not permitted on the East side. And our favorite restaurant when I was in Andrews Barracks was Milanos, near the train station. It is a pizza parlor so it stayed with the Italian theme. Some of the areas I once knew I was unable to find, but after forty years some have disappeared, like the train station when we left Berlin. It is no longer there either. I was so surprised to see that the Olympic pool at Andrews Barracks had barbed wire preventing anyone from using or entering the area. All the large buildings behind the chapel area are now gone as well as many buildings on Andrew Barracks grounds. Our former PX and theater building is still there, but at this point who knows whether that will be demolished next or kept. The trolley that ran alongside the Barracks near the entrance to Andrews was also gone, as were all those wonderful spots across the street that we used to visit for our bockwurst, beer, and fun. My first day of retirement was 9/11. I trust that is not an omen, but it was a day I felt relief from the corporate world, but an awful lot of sadness for the world. I had moved to Florida in 1990 wanting to get away from the cold weather in Maryland and Pennsylvania. I worked my last twelve years in Florida for a national direct mailing firm. We mailed direct mail and advertising materials for various corporations. Most persons could refer to that mail as junk mail. My department had been moved from Florida to Kansas City and I certainly didn’t expect to move from my newly adopted state. I only had three months to go to retirement so I took early retirement, and love it. I am however, busier than I ever expected. I do a lot of work for some church groups and patriotic organizations in my chosen field of typesetting/printing. When Jacksonville, Florida decided to open a cruise terminal three years ago I applied, was among the first employees hired, and enjoy working embarkation and debarkation of those cruising customers who like the boats and water travel. It is only several times a week, but keeps me busy and quite active. My wife is now retired and is satisfied with home projects and traveling rather than the work grind. We have found a great deal of happiness in our adopted state of Florida, and while we had a new house built a few years ago, we soon grew weary of all the yard work and purchased a condo two years ago; now someone else can do the work. Our church friends and activities keep us very busy, as well as traveling every chance we get. We do a lot of cruising with numerous cruiselines, and have recently spent a week cruising in Alaska and Hawaii. And yes, another trip to Germany is in the planning stages. My son, who was born in Berlin, wants to visit Berlin, and my daughter who took German in school also wants to go, so it looks like another trip as soon as the travel becomes a little more safe, the world safety problem as it is. Like most persons my age the body starts giving you some problems. I did have a very bad year in 2001 that I could have done without. In February I had a prostate cancer operation, my mother died after what was to be a simple heart procedure, we all suffered from the 9/11 problems, I was forced to retire in August, and I had triple bypass surgery in December. I am presently cancer free, thanks to some fast thinking and alert doctors, and I was able to have heart surgery without having first suffered a heart attack. I feel quite fortunate and count my blessings daily, that I came through everything and am doing quite well now. In 2007 I am still cancer-free and no heart problems. I am even planning an Applachian Trail hike early next year if the old body and legs don’t give out. I continue to be most thankful for all the friends I met in the military, and feel I am most fortunate to be in touch with many of them. I enjoyed getting together with some of those friends at the Washington reunion a while back. Many have surprised me with telephone calls after many years of not being in touch. I lost my house in a 1963 fire and practically all of my addresses and records were destroyed. So far my memory is still good and I have been able to get in touch with numerous Berlin friends. There are many persons, however, that I wish I could see again, and I continue looking at the various web sites and occasionally do find someone. I hope everyone found the happiness that I found in Berlin, my adopted home for almost four years. Having a child born in that great city makes it just that much more special to me.